Scoliosis is a complex condition so this post is merely an introduction on scoliosis, you know only the basics. I will post more specific info on it in later posts because it really is a complex condition that cannot be discussed in one blog post. 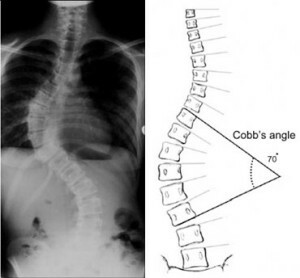 Scoliosis is a condition of the spine that results in an abnormal curve taking shape, but not just any curve, there is a measurable definition of at least a 10 degree Cobb angle. This last part is important to understand because even some physicians get it wrong when they call any curve in the A-P plane a scoliosis even if it is below 10 degrees or if it isn’t even a curve but a translation. Let me explain a few other things before we go on. The A-P plane is the anterior to posterior or front to back plane. In this plane our spine should be straight. In the sagittal plane or from the side view we should have several measurable normal curves. 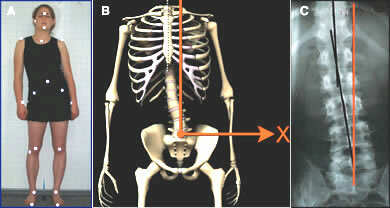 A scoliosis only occurs in the A-P plane but it can affect the curve in the sagittal plane. A cobb angle is a way to measure the spine in the A-P plane in order to determine the degree of displacement of an abnormal curve. A translation is a shift in posture or large section of spine in one direction. A scoliosis is an abnormal curve in the A-P plane of the body. There are several causes of scoliosis; the first is a congenital anomaly, meaning someone is born with an atypical spine that results in a scoliotic curve. The second is usually called idiopathic or juvenile scoliosis, this is the most commonly seen type of scoliosis and it is first noticed in adolescence with little understanding as to how it started hence the name idiopathic. The third is a secondary scoliosis due to an earlier condition like a vertebral body fracture causing the spine to curve abnormally. As I said idiopathic scoliosis is the most commonly seen type of scoliosis but the cause is far from unknown. We understand the cause of idiopathic or juvenile scoliosis as mulitfactorial making it complex to treat. Idiopathic scoliosis has a genetic component. This genetic component causes the vertebrae to develop asymmetrically creating the scoliotic curve, but not all people with the gene will develop scoliosis. All genes need an environment trigger to cause it to be expressed. What that trigger is, is unknown and that trigger may be different for different people so there is no way, in this age, to stop scoliosis before it starts. As this is merely an introduction on scoliosis I will stop here and save the rest for future posts. There is a lot of information to cover including the type of curves seen in a scoliosis and treatment protocols and which work the best, to name a few. Stay tuned.